Oldest known surviving license plate in Wisconsin, issued to a Mount Horeb man, 1905. Over the past century, automobiles have massively influenced Wisconsin's built environment and many aspects of our social behavior. But things were not always so. This 1905 license plate – the oldest known surviving plate from Wisconsin – documents a time when the State of Wisconsin was just beginning to grapple with the automobile age. At the turn of the last century, automobiles were a novelty on Wisconsin roads. Although tinkerers and visionaries had experimented with self propelled road vehicles for decades, it took the advent of the light, powerful, cheap, and reliable internal combustion engine to truly put Wisconsin on wheels. Gottlieb Schloemer of Milwaukee allegedly drove a gas powered auto on streets of Milwaukee in 1889 or 1890, but most historians credit the Duryea brothers of Boston with building the first successful American gasoline powered automobile in 1893. 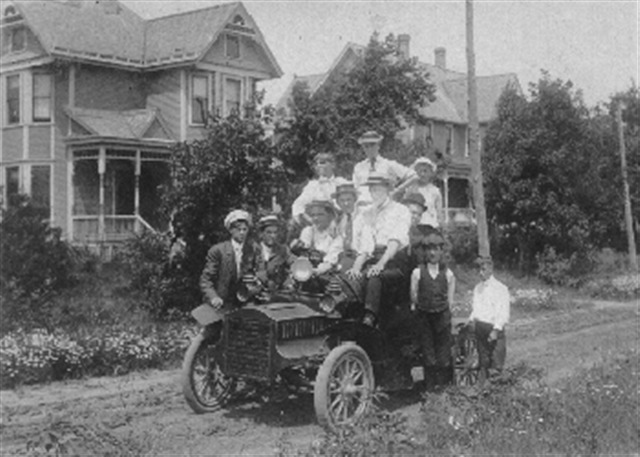 Within a decade, the Thomas B. Jeffery Co. of Kenosha had become the second American company, (after the Olds Motor Works of Detroit), to produce automobiles in large quantities. Though neither the Curved Dash Olds nor Jeffery's Rambler were the most technologically advanced vehicles of their day, they were the first to address a mass market. In Wisconsin, auto ownership grew in the new century. By the summer of 1903, the Madison Democrat newspaper announced that - with a whopping citywide total of nine cars - "Automobiles Become Numerous." Still, there were enough automobiles to attract the attention of lawmakers. Both Madison and Milwaukee began registering them in 1904. In Milwaukee, the $1 fee bought the owner a unique registration number, which he or she was obliged to post on the rear of the vehicle in Arabic numerals at least four inches high. Milwaukee issued no plates: these first license numbers could be attached to a home-made license plate or even painted on the car's bumper. In 1904, the State legislature passed a law requiring every Wisconsin auto owner to register his or her car with the Secretary of State's office. Registration cost $1 and was valid indefinitely. 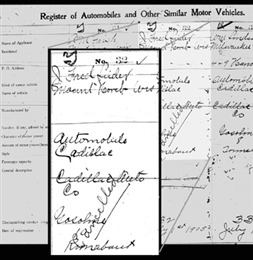 According to the statute, the Secretary of State's office would assign each vehicle a unique registration number and issue "an official number plate of uniform size and design containing [the registration number] in three inch Arabic numerals, followed by the letter 'W.'" Plates were to be displayed at all times in a conspicuous place on the rear of the automobile. The Secretary of State's office began issuing registrations on July 1, 1905. The State must have been stockpiling applications in advance of the July 1 issuance date, because it recorded 507 registrations that day – more than a third of the 1905 total. License plate number one was issued to Judge A.G. Zimmerman, who had acquired Madison's first automobile in 1901. This plate, the thirty-second license plate ever issued, was assigned to J. Fred Luder, Jr. a Mount Horeb cheese dealer. Luder's plate consists of a rectangular, dark gray sheet of zinc with aluminum letters "32-W" riveted to its front. It was made by the Schwaab Stamp & Seal Co. of Milwaukee, a business best known for making embossing seals and other stamped metal goods. Because registration in 1905 was valid for the life of the automobile, the plate bears no expiration date. Identical (except for registration number) plates were issued for the next six years. Fred Luder, Jr. (1883-1922) was born in Monroe, Wisconsin, the son of an immigrant from Kirchberg, Switzerland, who came to the United States in 1880 and eventually settled with his family in Mount Horeb in 1893. After graduating from Wisconsin Business University in La Crosse, Wisconsin about 1900, Fred, Jr. became a partner in his father's wholesale cheese business. Fred, Jr. may have used the car to visit area cheese factories on business, and perhaps, as the accompanying photo suggests, he also used it for fun. When this photo was taken, Fred, Jr. was still single (he married about 1908). In 1905, Wisconsin legislators did not envision thousands of cars swarming the state's roads and highways, but the signs were not long in coming. Within the next few years, newly formed automobile clubs joined Wisconsin farmers in campaigning for improved roads, and in 1908, voters handily repealed a constitutional ban on state funding of internal improvements. In 1911, the legislature undertook a major revision of Wisconsin's automotive laws. It authorized state spending on road construction for the first time and created the State Highway Commission to administer the funds and to engineer new roads. To cover administrative expenses and generate revenue for highway improvements, the legislature also raised the registration fee to $5 and instituted an annual registration requirement. Beginning July 1, 1911, Wisconsin license plates bear a year of issue. Undated plates like 32-W are remnants of a brief period before the State of Wisconsin moved wholeheartedly into the automobile age.